Eyes Open is a course for lower secondary students of English. It combines captivating video from Discovery Education™, with a unique approach that opens up a whole new way to view the world. Learning English becomes much more interesting, as students discover and explore the cultures and peoples of the world around them. 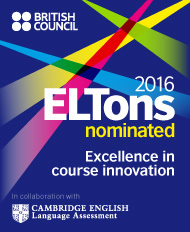 The book was nominated for an ELTons award in 2016 in the category of Course Innovation.